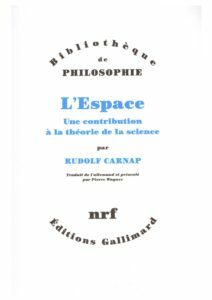 One of the main themes of my book about Carnap is that a decisive component of the original motivation first to write the Aufbau and then to push forward to the radical pluralism of the Syntax (and beyond) was Carnap’s diagnosis of the political situation immediately after the First World War in Germany. Amidst revolution and upheaval, Carnap saw very clearly that the German intelligentsia had contributed to the outbreak and continuation of the war by failing to get politically involved in the 19th century as French and British intellectuals had done, and thus failing to restrain the German elite’s war-oriented Betonköpfe (yes, that’s an anachronism — to make a point). So he advocated greater political involvement (and got involved himself), but also thought that to prevent future wars, the chaotic development of societies over the past century or two of rapid industrialization had to be steered by reason to a greater extent. But there existed no satisfactory account of reason, no system in which all the knowledge accumulated by the sciences over the past century could be seen to fit together. In contrast to the traditional Enlightenment system of knowledge (e.g. the Encyclopédie), where the various parts and components of knowledge were anchored in the various human cognitive, practical, and other mental faculties — so that the system was ultimately grounded in human psychology — Carnap (having studied with Frege) thought, like Leibniz, that the system of knowledge should be deductive. And so on from there. Bill died earlier this week. He’d been ill for a long time, but when I last talked to him it had stabilized, and while he was unable to travel internationally (so I haven’t seen him in a while), he was unconcerned. I had only got to know him personally a few years ago at a conference in Nancy organized by Gerhard Heinzmann. I am particularly devastated by this news because he and I had, since that conference, been discussing various Carnap-related issues, first surrounding his 2011 paper in Journal of Philosophy on extending ESO to the realism-instrumentalism controversy, through its various drafts before it appeared (in my Oxford Bibliography on Carnap, I call it the “deepest and subtlest analysis of ESO published to date, probing questions Carnap left open”); he had given an early version of it at that Nancy conference. He republished it along with several other papers on Carnap (and other matters) in his collection Logicism and its Philosophical Legacy. When I read that book, I was struck how the Carnap papers added up to a very compelling and original overall interpretation which, however, was never spelled out in any one of them. I mentioned this to him a year or two ago when I was inviting papers for the Monist special issue on Carnap, and asked whether he’d be willing to write such a paper for that issue. It turned out that he’d been thinking exactly the same thing, about a general synthesis putting his overall view of Carnap together in one place, and would be happy to do that for the Monist issue. So I was very much looking forward to getting his draft so we could continue our conversation begun in Nancy. Even a few weeks ago he was still hoping to send me something before the end of the year. Alas, it will never be! It is a loss for the Monist issue, a loss for the Carnap world (and even the world at large, I would venture) not to have this general statement of his exceptionally careful and well-thought out conception of Carnap, and a particularly acute loss for me personally, as I’d really been looking forward to arguing with him about that conception. One shouldn’t let one’s self get so distracted, one shouldn’t put things off for too long!